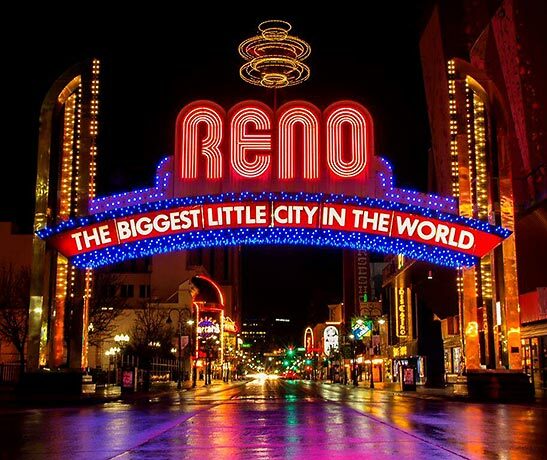 "The Biggest Little City in the World" is a perfect slogan for Reno, nestled in the elevated desert at the base of the Sierra Nevada, with the heart of the city in the valley of the Truckee Meadows. 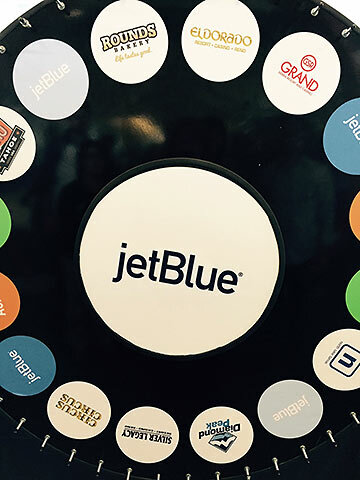 For those who don't want to deal with the overwhelming Vegas strip and want more from a vacation than slot machines and glowing neon, then Reno is virtually the biggest little city to savor and enjoy. 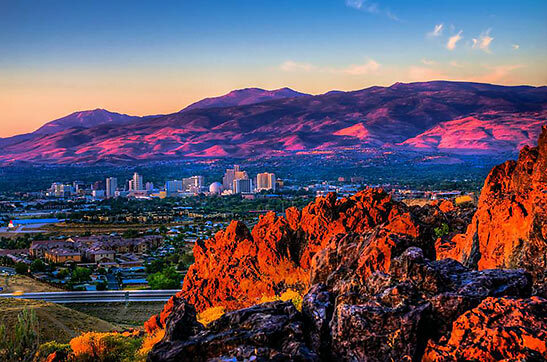 With a population of about a half million for the Reno/Sparks area, it may not be the densest in population, but the destination boasts enough diversity that it truly earns that "biggest little city" moniker. 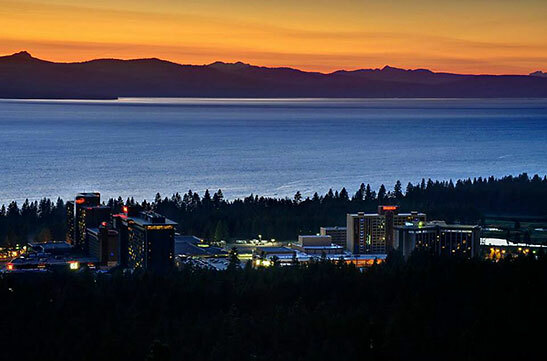 And Reno and Lake Tahoe, together, as a vacation destination, present not merely opportunities for rousing casino pastimes, electrifying nightclub shows, and truly fine dining, but also, the two cities offer outdoor pastimes, historic sites to visit, colorful sightseeing, and the splendor of Lake Tahoe itself (not to mention about 300 days of sunshine a year). 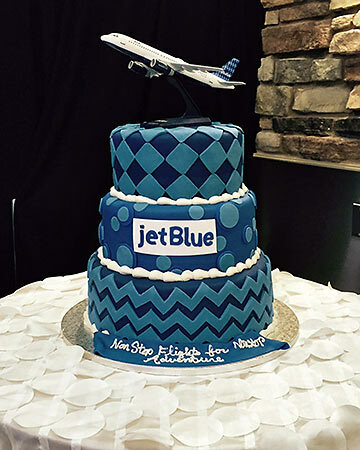 At the arrival gate, there was even more revelry. 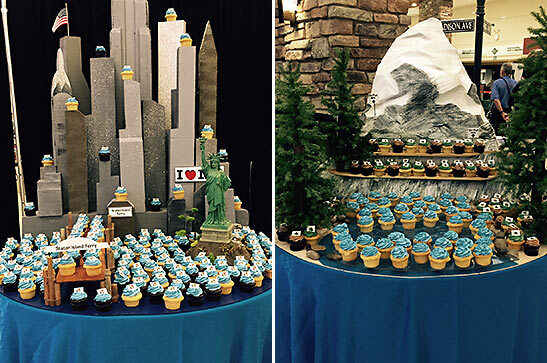 A brass band welcomed the guests  playing, of course, "New York, New York," and there was New York style-pizza, black-and-white cookies from the Atlantis Casino Resort Spa, more sweets from a confectionery shop, the New Yawk Bakery, little trinkets to remember the flight, and two large tables laden with cupcakes, all iced in JetBlue's signature azure hue; these two tableaux were set up, one representing New York, the other, Reno/Tahoe, to create a symbolic bond between the two newly joined cities. There are thirty-some hotels to select from in Reno, and I ensconced myself at the El Dorado for my very short stay there (I was soon going on to South Lake Tahoe for diversified sight-seeing). I settled into a sumptuous corner room  and lo and behold, mirabile dictu!  in my room, which was sized for royalty, was a colossal Jacuzzi, perfect for a soak (for a few people! ), while taking in the vista (with a wondrous view over the illuminated dome of the National Bowling Stadium). It was a smart move to start off with a relaxing hot-tub immersion, since after that, I was on a virtual go-go-go treadmill, with much to see and do and only a few days in which to do it all. 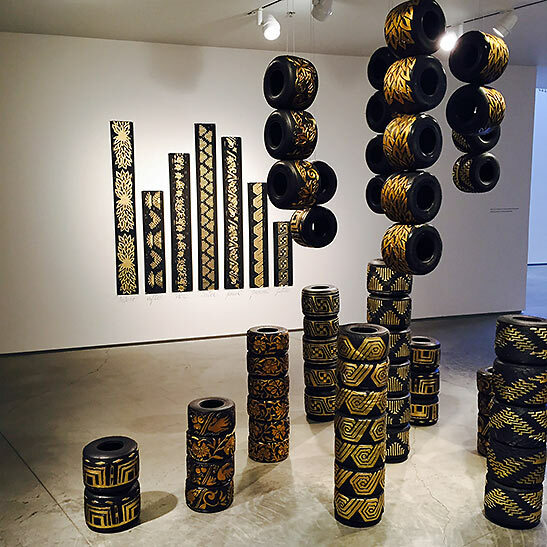 I started off my sojourn city-side, taking advantage of local culture, with visits to the impressive Nevada Museum of Art and the Terry Lee Wells Nevada Discovery Museum. The art museum's permanent collection consists of more than 2,000 richly diversified works of 19th through 21st century art with four areas of focus. The building itself is recognized as one of the most distinguished architectural achievements in the state, with its torqued exterior wall, suspended atrium staircase, and views of Reno's skyline, as well as of the Sierra Nevada. And its casual-style restaurant, Chez Louie, deserves a few accolades, itself. 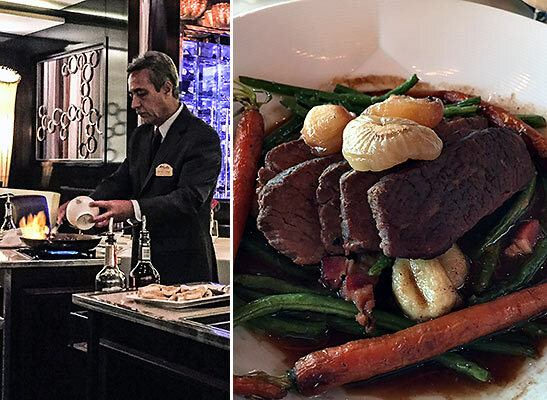 The cuisine is French-inspired, and is supremely healthy fare, designed by Mark Estee. 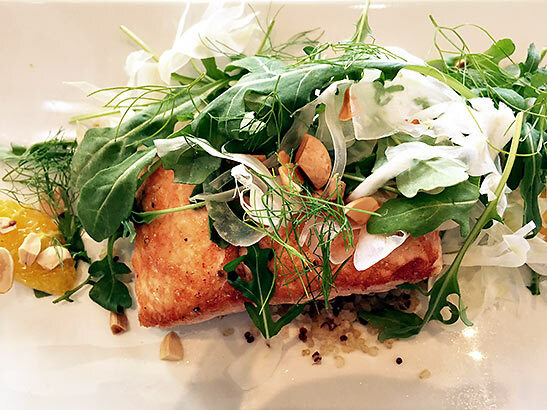 Expect wonderfully appetizing dishes  for lunch, I feasted on grilled, marinated chicken breast, with pumpkin seeds, sun-dried cranberries, pickled onions, gorgonzola, and candied pecans, all tossed with a toothsome sherry vinaigrette. For the kids (and dare I say, for adults, too), the enchanting Discovery is a font of information  scholarship, science, and delightful fun all rolled into one. It is a place for kids of all ages to prod, poke, quiz, query, and discover their own answers. Within the 67,000-square-foot facility, there is a three-story-high "cloud" structure that presents children with a challenge to climb into celestial heights; a cave; a mineshaft; interactive games; workshops; how-to exhibits; and a truly engrossing gift shop. Opened in 2011, the Discovery has hosted more than half a million visitors. 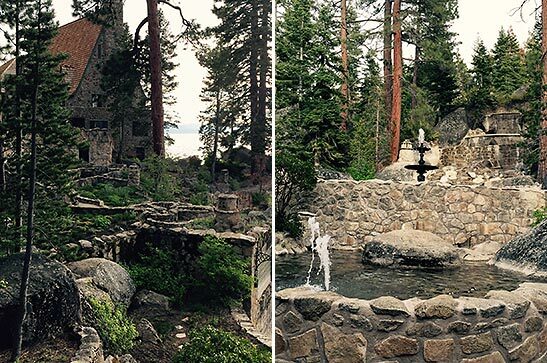 To cap off the day, I headed to Thunderbird Lodge (in Incline Village) with my traveling companions to experience a cool sundowner and a lakefront sunset, from this "castle-in-the-sky." Built in 1936 by banking and real estate scion George Whittel, the estate features nearly 25 miles of pristine shoreline. An early conservationist and environmentalist, Whittel also bought the surrounding 45,000 acres, which are now protected. Thus, happily, the estate remains intact; there are several out buildings that have been preserved, as well, including a butler's domicile, a card/game house, an "elephant house" for Whittel's pachyderm, and a well-conceived boathouse. 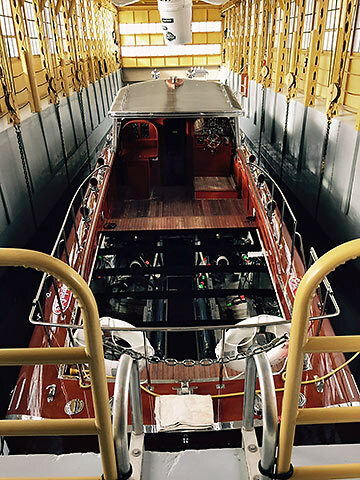 The latter protects Whittel's fifty-five-foot, mahogany yacht, which was painstakingly restored by casino magnate, Willian F. Harrah, in 1962. The mansion itself is a homey stone structure, with a steep inclined roof; the grounds are well appointed by exquisite landscaping. The main house is "secretly" connected to the boathouse with a 600-foot underground tunnel, blasted through granite; visitor tours include a "romp" through the tunnel. There are many interesting side trips to take from Reno/Tahoe and I took my first jaunt (eastward) to Virginia City (where both gold and silver were discovered), once a vital settlement between Denver and San Francisco. During its heyday, the metropolis' mining profits amounted to billions in today's dollars. The picturesque Victorian-era town still sports wooden boardwalks, Old West-style saloons, historic churches, 19th-century homes, quaint cemeteries, and over a half-dozen quirky museums. 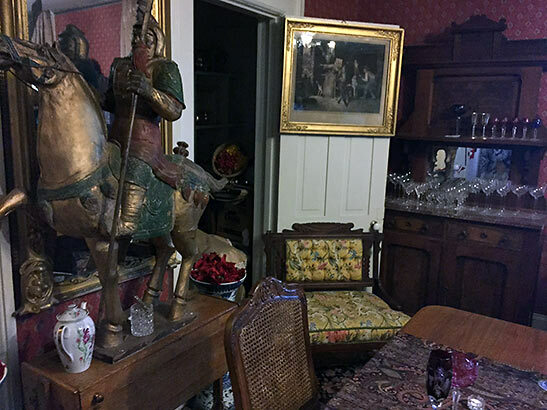 There is a Mark Twain museum  small, but don't miss it if you have any interest in Twain  and there is also a fascinating police museum, the Peace Officers Museum. For me, a highlight of the area was a visit to the august (and perhaps "haunted?") Mackay Mansion, home to the eponymous, renowned Western family. John William Mackay was a well-to-do mining tycoon, who was responsible for the legendary Comstock Lode. His son, Clarence Mackay, was chairman of the board of the Postal Telegraph and Cable corporation and president of the Mackay Radio and Telegraph Company. Clarence's daughter, Ellin, married Irving Berlin, in what was a less-than-ideal (to her father) union. There were rumors that Mackay disinherited her and didn't speak to her for years; it was also reported that Berlin, in an effort to reassure her father that Ellin would always be on sure financial footing, assigned the rights to his ever-popular song, Always, to his bride. Whether this is apocrypha or truth, the families apparently experienced a rapprochement. There is also an old mine shaft (a real one, part of the Best & Belcher Mining Company) you can explore with a guide and even learn about the etymology of the expression "canary in the coal mine." 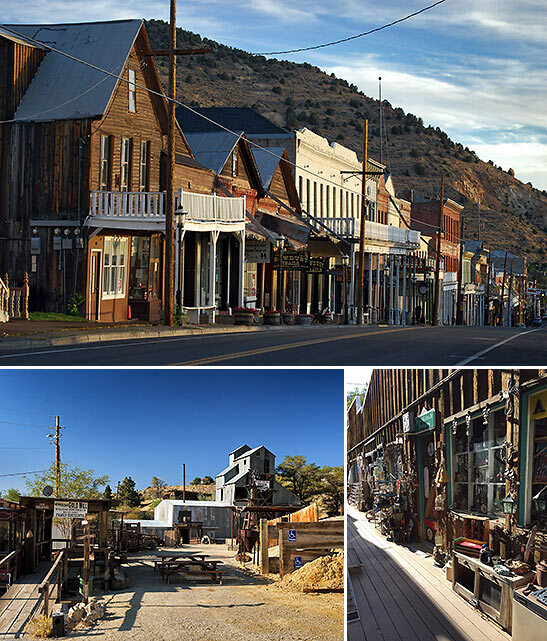 There are endless festivals, holidays, parades, and events in Virginia City, from January's "Devil Made Me Do It Saloon Crawl" to December's "Gingerbread Social and Auction." Also in December is the V & T Cane Express. The V & T refers to the well-known railroad, the Virginia &Truckee, which was rebuilt in 1974, replicating the ornate open and closed cars from yesteryear. The chug-a-lug steam and heritage diesel train goes from Virginia City to Gold Hill, where you can alight and visit the historic Gold Hill Hotel (also haunted? 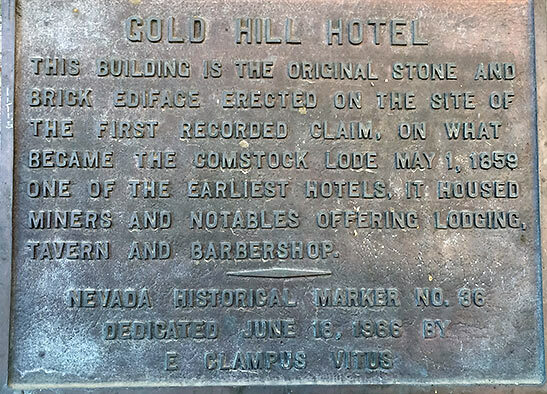 ), Nevada's oldest hotel. Construction of the railroad began in 1869 and in the next 75 years or so, the V & T was responsible for moving millions of dollars' worth of gold and silver from the Virginia City mines to Gold Hill, Silver City, Reno, and Carson City. And if you are interested in railroads, then head to Carson City, where the Nevada State Railroad Museum is enlivened by a functioning railroad that encircles the museum's footprint. For car buffs, there is the National Automobile Museum in Reno, with over 200 fascinating vehicles, most displayed in situ, in street scenes. One other interesting site to visit in Reno  the likes of which you will not find anywhere else in America  is the National Bowling Stadium, which The Los Angeles Times referred to as the "Taj Mahal of Tenpins," a paean to the sport. With a staggering 78 lanes! 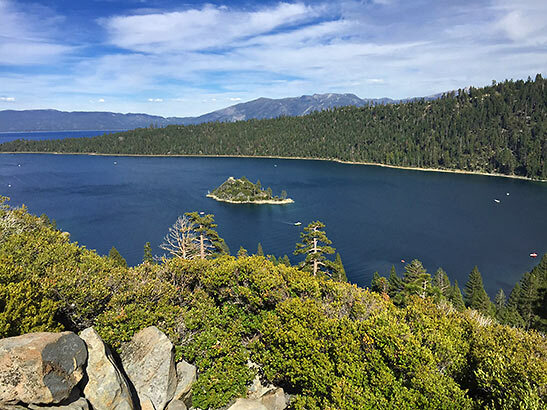 You cannot visit the area and specifically Lake Tahoe (elevation over 6,000 feet), without lollygagging all around the perimeter (72 miles and about a two-hour leisurely drive), as various points offer extraordinary and diverse views, as well as fascinating villages, topography, and commerce. The lake is 21.6 miles long and 12.2 mile wide, with an average depth of 989 feet. About two-thirds of the lake is in California, and the remaining third or so, in Nevada. 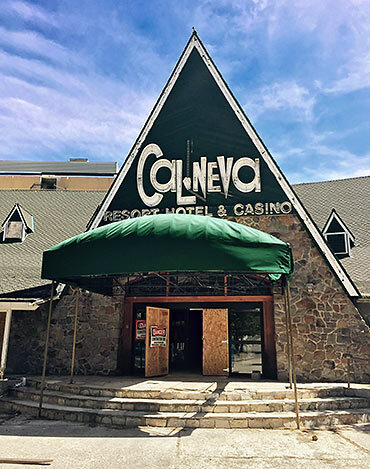 Right at the state line, be sure to check out the CalNeva Lodge & Casino, a haunt of the Rat Pack (and once actually owned by The Chairman of the Board himself and pal Dean Martin), and currently under renovation, scheduled to reopen this year. 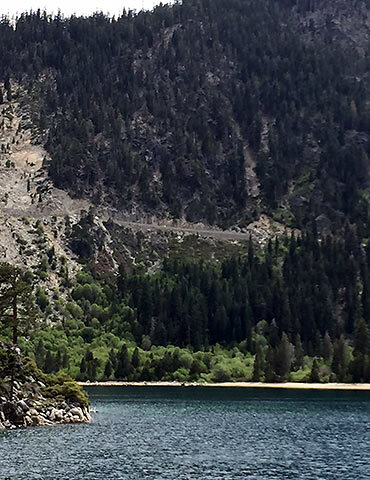 While it's true that the hotels, casinos, and the plentiful ski resorts are a big draw to Reno/Lake Tahoe, one has to remember that it is the natural alpine splendor of the area that draws campers, hikers, and outdoor devotees. And for all, a boat trip on the lake, to Emerald Bay, a jewel of a crook in the lake's perimeter, is de rigueur. Be sure to visit the lakeside during the evening, as well, for a wonderful sunset panorama. One last note, but hardly a footnote, is that the area offers wonderfully indulgent and diverse dining, whether you select a sumptuous breakfast at the Grand Sierra Resort; the Atlantis Resort Spa Casino's primo steak house; the Pho Mein Asian noodle restaurant at the El Dorado; a lakefront table at the Edgewood Tahoe Resort for a gourmet repast; an over-the-top breakfast at the Red Hut Café; an outta' sight burger or pizza at Basecamp Pizza in Heavenly Village; fine dining and the signature martinis at 19 Kitchen Bar in Harvey's Casino; or, for a respite, just a delectable, afternoon coffee at the Hub, where they roast their own beans. Regardless of where you stay, what you do and see, where you dine, and what activities you choose to participate in, you will, at the end of your trip, agree that this is the biggest little city, offering so much diversity and fun.